Easily insert icons and Scalable Vector Graphics (SVG) files into your Microsoft Office documents, workbooks, emails and presentations. Once they're in place, rotate, color, and resize them with no loss of image quality. Don't see this feature? Inserting icons and SVG files are only available to Office 365 subscribers. Scroll through the icons or jump to a category by clicking the name in the navigation pane at the left. Choose an icon and then click Insert at the lower right. Insert multiple icons at the same time by clicking each of them before clicking Insert. Rotate, color, and resize your icon by following the instructions here. Tip: Want to quickly change the color of your icon? Right-click your icon, choose Fill, and select the color you want. 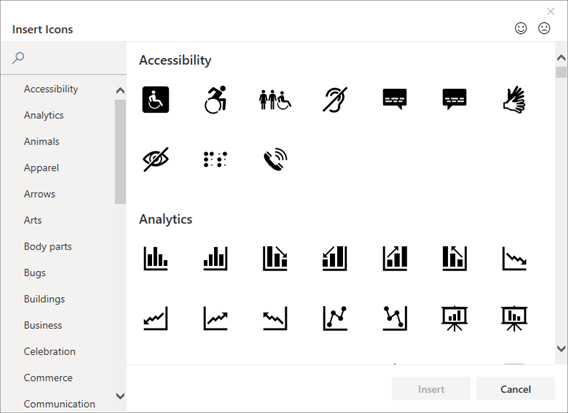 The process to insert icons on Visio is slightly different. Here you need to go to the Shapes menu, choose Basic Shapes, and then Icons. From there you'll be able to select one of the categories of icons and choose the icons you want to insert into your diagram. SVG stands for scalable vector graphic file, which means you can rotate, color, and resize the file without losing image quality. Office apps, including Word, PowerPoint, Outlook, and Excel, support inserting and editing SVG files. Insert an SVG file in Office for Windows: Drag and drop the file from Windows File Explorer into your document. Insert an SVG file in Office for Mac: Go to Insert > Pictures > Picture from file to insert your SVG images. Insert an SVG file in Office on Android or Windows Mobile: See Add pictures or videos to a file by using your mobile device for more information. This article was last updated by Ben on February 15th, 2018 as a result of your comments. If you found it helpful, and especially if you didn't, please use the feedback controls below to share your thoughts so we can continue to make it better.